Arthur Stafford was born in Sunderland in 1918 and was the son of Frank and Amelia and brother to Dora and Robert. He was educated at Armstrong College Newcastle on Tyne and shortly after leaving school the family moved to Northallerton when his father became the Clerk of Works for the North Riding County Council and Arthur was employed as a joiner with Moody's Building Contractors. Sport played a large part in Arthur's life and he excelled as an all round sportsman. His favourite sport was football and at one time had a trial with Sheffield Wednesday but locally he played at inside right for the Northallerton Lions soccer team. He was also a leading batsman with 'The Mount' which was a cricket team run by Mr Weston-Adamson who owned the Mount Mansion on Yafforth Road, which was later to become the local maternity hospital. One local well known man, Sydney Weighell who became the leader of the National Union of Railwaymen also played for 'The Mount' as a fast bowler. Arthur was also a keen amateur boxer and also played rugby union. 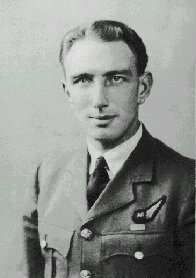 On the outbreak of war in 1939 Arthur volunteered for the RAF and was accepted for aircrew training. On completion of his training as a Wireless Operator Air Gunner he was posted to No 97 (Straits Settlements ) Lancaster Squadron based at Woodhall Spa with which Arthur flew several operations. On the 17th April 1942 six Lancasters of No 97 Squadron and six Lancasters of No 44 (Rhodesia ) Squadron were sent on a low level day light raid to the M.A.N. Diesel factory at Augsburg. Daylight bombing was very rarely carried out by the RAF and this raid was considered to be extremely dangerous. In the event this proved so, the raid was not a great success. Four Lancasters were shot down en route and three lost near the target. It was on this famous raid that Squadron Leader J.D. Nettelton was awarded the Victoria Cross for gallantry and when Sgt Arthur Stafford was awarded the Distinguished Flying Medal for bravery. Arthur carried out three other daylight raids with 97 Squadron which included two to Italy when on one of those raids Arthur wrote a letter to his parents in between operating his guns. It was while he was in the RAF that Arthur met and became engaged to Olga Smith a girl from Osmotherly. In the summer of 1942 Alan was commissioned to Pilot Officer and in early 1943 was posted to No 101 (Special Squadron) and promoted to Flying Officer. No 101 Squadron was a squadron fitted with ABC (Airborne Cigar) radio jamming equipment with German speaking crew members. Arthur was selected to fly with the squadron as he was fluent in German and it was he who would operate the equipment. These ABC jammers were used to confuse the German fighter pilots and the German fighter controllers. On the 23/24th September 1943, a grand total of 633 aircraft consisting of, 312 Lancasters 193 Halifaxes 115 Stirlings 8 Mosquitoes and 5 American B17s Flying Fortresses took part in a night raid on Mannheim, No 101 (ABC) Squadron acting as decoy. In the raid the factory of I.G Farben at near by Ludwigshafen was totally destroyed. Out of the attacking force, 18 Lancasters 7 Halifaxes 7 Wellingtons were lost. The normal Lancaster carried a crew of seven but the ones of No 101 Squadron carried eight. The eighth member being the German speaking specialist. One of the Lancasters shot down was one that Arthur was operating the ABC radio jamming equipment, the aircraft crashing near Metz. Of the rest of the crew, P/O Tuston and Flt/Sgt McGillvary baled out and became prisoners of war, the rest died in the crash. This was Arthur's 41st sortie and but one intense period prior to the Mannhiem raid he flew five bombing missions in seven nights to the heavily defended Ruhr industrial district. These series of raids were known as the Battle of the Ruhr. These operations proved to be so exhausting, his brother Robert said that he would to sleep for up to twenty four hours when he came home on leave, such was the pressure for bomber crews. The paradox of flying on bombing operations with all the terror that went with it, and then the return to the normal life of the pub and the English countryside to be followed by yet another trip over Germany created an air of fatalism for bomber crews. Arthur Stafford lies buried with his crew members in grave No 17 Row No 3 at the Commonwealth War Grave Choloy Military Cemetery Meurthe-et Moselle France the same cemetery as Sgt. Malcolm Charlish of Bedale is buried. He is remembered in the Central Church of the Royal Air Force St. Clement Danes London, the Romanby War Memorial and on the Memorial in All Saints Parish Church Northallerton. On December 5th 1944 Arthur's father went to Buckingham Palace to receive the Distinguished Flying Medal on behalf of Arthur from His Majesty King George VI . In 1947 Arthur's father received from the Mayor of Metz, a small wooden casket. Inside was a brooch fashioned into the town crest made from part of Arthur's Lancaster. On the casket there is a small picture of the Metz town with a small French tri-colour flag. This is a most treasured memento of the Stafford family. Arthur was aged 25 years.